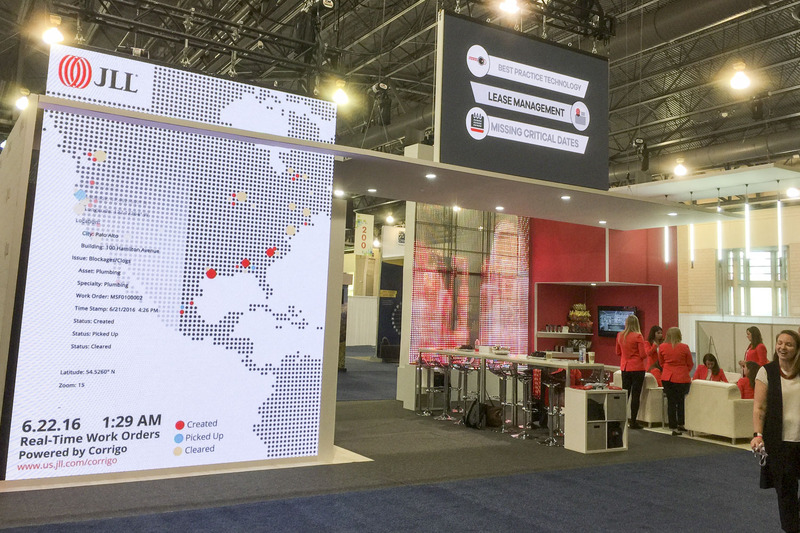 At the CoreNet Global Summit in Philadelphia, JLL and MIG partnered together to create an unmatched booth experience. Summits and other events like these are a great opportunity to promote a company’s brand and to make new connections. 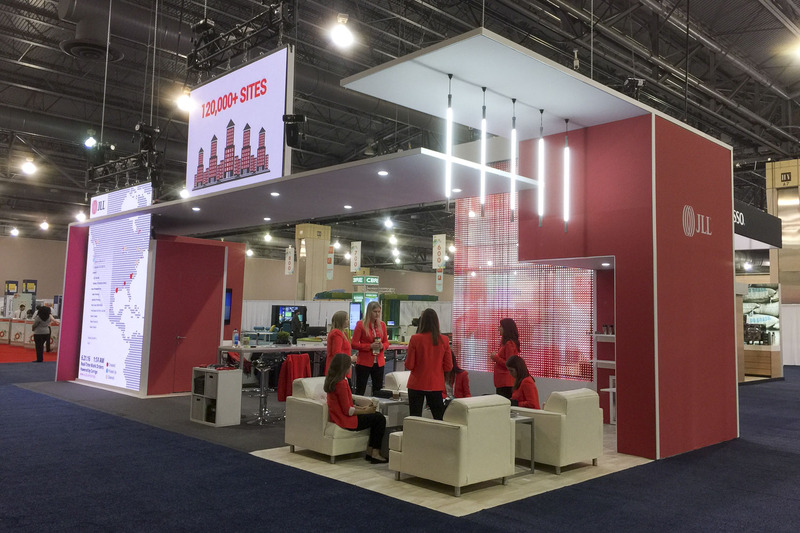 MIG was approached to re-imagine JLL’s trade show booth to maximize space and deliver a targeted brand message with the intent to attract, disarm, and engage attendees. MIG’s exhibit design services team readily took on the challenge to create a space that allowed attendees to engage in conversation and network, while optimizing the area to enhance the brand experience. The conceptual design was an open environment with screen technology that felt intimate, allowing formal and informal interaction, while showcasing the JLL brand in a powerful way. Our goal was to minimize booth structures and maximize conversation zones. MIG created a 20’x 40’ booth, included three LED surfaces and a communal area with two open meeting spaces. The layout strategically used only 20% of the floor space and allowed for a unique, asymmetrical design that pushed traditional aesthetic limits. Since large amounts of screens consume a large amount of space, the final layout consisted of a large open area in the middle, a small closet with a LED wall, and a niche area that increased interior space, allowing two semi-private meeting spaces and one central conversation area. Next was the placement of the screen surfaces within the layout. The cornerstone piece, a 12’ tall LED tower, rose from the floor and intersected with a ceiling component. With JLL’s vision in mind, the MIG team pushed the massive LED element to the front of the booth, eliminating non-essential components along the way that took up space. This freed the middle of the booth for a communal charging table with the capacity to seat 12. Identifying the need to attract attendees from across the summit hall, the MIG team positioned a 6’x10’ LED surface 15’ in the air, above the ceiling to catch the eyes from attendees throughout the venue. Additionally, a double-sided 14’ LED curtain was created to display environmental media. Three 70” displays at eye-level concurrently ran a variety of video messages highlighting JLL services, giving attendees 360° exposure to the JLL brand, no matter where they stood. MIG worked collaboratively with JLL to find creative solutions to vividly display screen technology within a limited space. Once the MIG team orchestrated the right placement of technology, they acted as experience agents for JLL to ensure multi-faceted brand messages reached every attendee at different areas of the venue. A holistic experience was key to JLL, down to the details. “ As we started to develop our project plan for an annual industry conference, we knew we wanted to engage a creative production team to help elevate our presence in the exhibit hall to stand out amongst our competition. From our first meeting, I knew MIG was going to be a partner that brings results. Not only did they deliver a phenomenal product, they were such a pleasure to work with, came in under budget and we stood out as the best booth in the exhibit hall.